Kailash is considered the holiest mountain on earth by a number of faiths and religions. 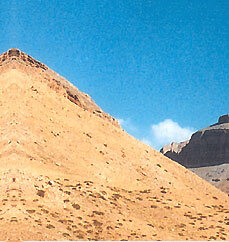 Kailash is considered the holiest mountain on earth by a number of faiths and religions. Through millennia, monks, yogis and pilgrims from all over the world have braved unimaginable hardships to reach this abode of gods. Its exceptional isolation and the peculiar contours of black granite that give it the appearance of a Shivalinga, have caused Kailash to be venerated as a place that is both representative and emblematic of Shiva. For Hindus, a journey to Kailash is considered the ultimate yatra due to both the difficulty of reaching it and the level of sanctity attached to it. Traditionally, Indians have embarked on many difficult yatras and, in the process, found that some places radiate and elemental energy not felt elsewhere. Physically the journey culminates in a definite destination, a tirth sthana or a place that enables one to 'cross over'. The symbolic crossing is from ignorance to knowledge, from mortality to immortality. The tirtha sthana holds a special significance either because it is associated with a religious event or it may have a special location which evokes an experience outside the dull and gross phenomena of daily life. It is usually a place that lifts the mind out of its limited functioning, stretching it to grasp new meanings. While proceeding downwards from Dolma - La (Dolma Pass), a steep descent to Gouri Kund at 5608 m, also called the Lake of compassion as referred to in the shiva Purana this is the setting for the legend of Parvati and how Ganesh acquired his elephant head bathing in the emerald waters of the kund, Parvati fashioned an image of Ganesh from the soap suds on her body, breathed life into it and placed it at the entrance of her home to prevent anyone entering. Lord Shiva happened to return at this point of time and was stopped by Ganesha. Indignant at this affront, shiva cut off the boy's head. Pravati was inconsolable and insisted that the boy be brought back to life shiva took the head of a wandering elephant and placed it on the body. Life was restored and Parvati had her son back. Manasarovar is what remains of the Lake Tethys, considered the source of all creation. As the legend goes, Brahma created this lake for his meditation and worship. Literally speaking it is manas + sarovar. Manas refers to the mind of the supreme God Brahma, the lake being its outward manifestation. The sacred Manas is at a height of 4560 m with a circumference of 110 km, which can be trekked in about three days. It has a depth of 300 ft and covers an area of 350 sq. kms. The Parikarma, or circumambulation, of the natural shrines forms an important part of the journey to Kailash and Manasarovar. The Shiva Purana says: 'There is no sin in the world which cannot be destroyed by circumambulation. Hence one should dispel all sins by circumambulation alone. 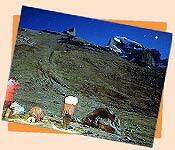 The parikrama or circumambulation of Kailash is a three - day trip, 53 kms long, and the most sacred for all yatris. It is performed in a clockwise direction. Followers of Bon, The Pres - Buddhist religion of Tibet, perform it anticlockwise. For the Buddhists, the parikrama around Kailash is equivalent to going through a cycle of life and rebirth into a new life. Established in 1998 with a commitment to provide professional and personalized services to each of our clients within India, Nepal, Bhutan & Tibet. We are leading tour operators of India working hard with a motive to promote tourism industry of India. Having all modern communication facilities in office and well experience tour executives, we can assure you to organize comfortable and memorable holidays in India, Nepal, Bhutan and Tibet. You may refer comments given by our old clients.